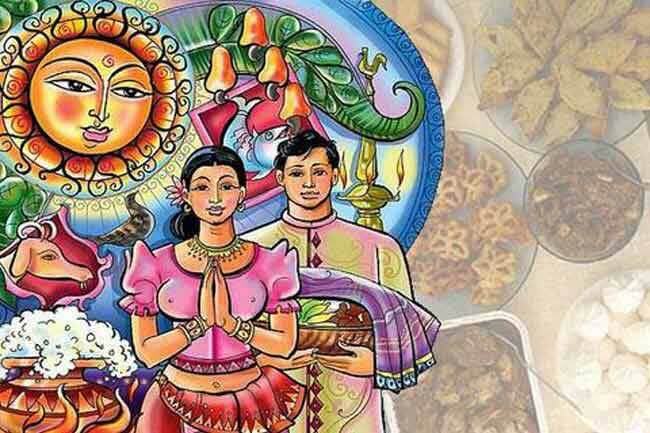 The dawn of the Sinhala and Tamil New Year will be celebrated in Sri Lanka today (April 14). The New Year which is known as ‘Aluth Avurudha’ in Sinhala, and ‘Puththandu’ in Tamil is celebrated by both communities through various rituals and customs. According to traditional astrological belief, the sun completes its movement across the twelve segments of the Zodiac in the course of a year taking one month to travel each constellation. The transition of the Sun from the house of Pisces to the House of Aries marks the beginning of New Year (Aluth Avurudu). A number of customs and traditional beliefs are associated with the New Year celebrations in the country. The Sinhalese are influenced by astrological faiths and perform several religious practices during this time. The new moon can be seen on the 07th of April (Sunday) and the 09th of May (Thursday). Preparing meals for the New Year should begin at 2.42 p.m. on the 14th of April (Sunday). Lighting the hearth clad in red & yellow mixed (bronze colour) clothes and facing East.